2. Also, we don’t pay them for all work around the house. There are some tasks they simply do because they are part of the family. For us those include things like making beds, doing dishes, setting/cleaning the table, walking the dog, getting the mail, packing school lunches, and picking up toys inside and out. 3. We don’t pay them equally. Some chores are worth more than others because of their difficulty. The older they get the more chores they do and the more they get paid. 4. Finally, there are additional chores they can voluntarily choose to complete for extra money. The question of how much to pay kids for chores is a tough one. I’ve heard many say the going rate is $1 per task. To me, that rate seems like a good starting point, especially for the young ones. However, as ours aged and the tasks became more challenging, we increased the amount. My best suggestion is to make the amount paid a part of the monthly budget and do what you can afford. This has to be a personal decision upon evaluation of your own family budget. Furthermore, remember that the real reward is found in the work ethic and responsibility being developed. The amount they actually earn is of secondary importance. If you can’t afford much, try substituting other rewards for chores in lieu of money. Perhaps staying up later, watching an extra hour of TV or getting an additional 30 minutes playing on the iPad could be options. Some quick calculations would cause me to agree. If all the chores are completed, we are handing over $28 per week to our kids. That’s approximately $1,450 per year. 1. Every week somebody forgets at least one chore, so the actual amount is often less. 2. We can afford and do budget for this. So this money doesn’t keep us from putting food on the table or keeping the lights on. *It’s taught them the value of completing more challenging tasks. They are rewarded more and thus are driven to attempt them. *It’s helped them buy their own stuff. My daughter purchased her own iPod with the money she saved from her chores. *It’s taught them to use their money wisely. It means more to them because they earned it. What we have found is that paying our kids for chores evolves over time. In fact, now that our daughter has turned 16 we are looking at doing something entirely different for her. Instead of paying her weekly for her completed chores, we are looking at paying her monthly. Here is how that would work. We will look at all the expenses we might have for her in one month. This would include of course the amount we would pay for her completing all her chores. We will still hold her to those responsibilities and give incentives if she does more. But the amount would also include money we would spend on clothing for her, incidental school related items, special events, etc. We would then take that amount (ex. $150) and give it to her all at one time at the beginning of the month. She would then be responsible to manage that money for her needs for the month. The point of this is to have her set up a budget her own money. We will also open a checking account for her with her own debit card. Teens need to learn budgeting before they set out on their own. What better time to do it than while still under your supervision. Budgeting is a skill they will need if they are going to have long-term financial success. We will see how that goes. Our oldest has been pretty good with money so far, having already earned a good amount on her first summer job last year. I’m looking forward to seeing how she will handle the added weight and responsibility of this change. If you’d like to download a sample chore sheet you can find one on my “Resources” page by clicking here. It’s an Excel file so you will be able to customize it to whatever chores are being done in your household. And finally remember, with chores it’s not necessarily how much you pay your kids that makes the process beneficial. Questions for Discussion: What thoughts do you have on how much to pay kids for chores? How many chores are too many? Are there chores your kids do just because they are part of the family? Anyone use alternative reward options for finishing chores? Could you do laundry by the time you were a freshman in college? Theres one comment on here im not very fond of. kids are workers there kids sure doing chores is good but your supposed to raise them not work the. Well, I think it’s OK to pay for extra jobs around the house. If your kids are looking for some spending money, commission them for a job that you’d otherwise hire someone else to do, like cleaning out the overflow in the attic or something else and letting them sell what they find. I had a classmate in high school who was freaking out when we were all going to college because she’s never done a load of laundry in her life. Me? I’ve been doing laundry since I was 5 (started with sorting/folding)! I like the idea of having some chores not paid for because they’re just things you’re expected to do. I’m glad you mentioned those. Any blowback from the kids’ friends who do better at their homes? Seems likely, since your rates are reasonable, but a lot less than what other parents might pay. They haven’t mentioned anything but now I’m gonna ask. 🙂 They seem really content with the pay…I’ve not once heard them complain about what they are getting. I like that – that they are not complaining. You are welcome. It’s always good to come back to these things and let people know how you are mixing things up when circumstances change (i.e. the new strategy with our 16-yr. old). Informative blog post ! . I like how you have everything laid out and the given pay for each item. Speaking of which if others are searching for a GSA Form 618D , my kids used a blank version here “https://goo.gl/KrThrw“. I like how you explained everything and it was great for my kids to hear that “other parents do X and Y and Z” as well..for example kids won’t get paid for doing some work that is just contributing to the work of meals and having clean clothes in their drawers. Do your kids get to spend the total of their allowance (we use the term commission at our house) or do they need to spend some, save some and share some? We use the term “commission” also. They all have saving, spending and giving jars to put their money in. They all have bank accounts as well so when the saving jar gets too full they get to take it to the bank, which is a fun learning experience for them. Brian recently posted…What Does God Want Me to Do with My Life? I realize I’m late to the party here, but I somehow just found your site! We have set up a similar situation with our kids, but think of their allowance (yes we call it that) more of a salary. They have to do their household tasks without argument, threat or reminder. They ALSO have to be friendly, pleasant members of the family. We have teens now and all have been on their own budgets since age 8 and pay for their own clothing, shoes, activities, food away from home, charity, gifts and fund their savings. This is done with their very significant allowance for which they do very significant work for us. As they get older, I’d suggest decreasing your kids allowance rather than increasing it, starting at age 16. Once they can start earning their own money, they should depend on ours less with the idea they are paying for most of their own expenses by the time they are ready to move out. I cannot wait to read the rest of what you have to offer. This is a great site! 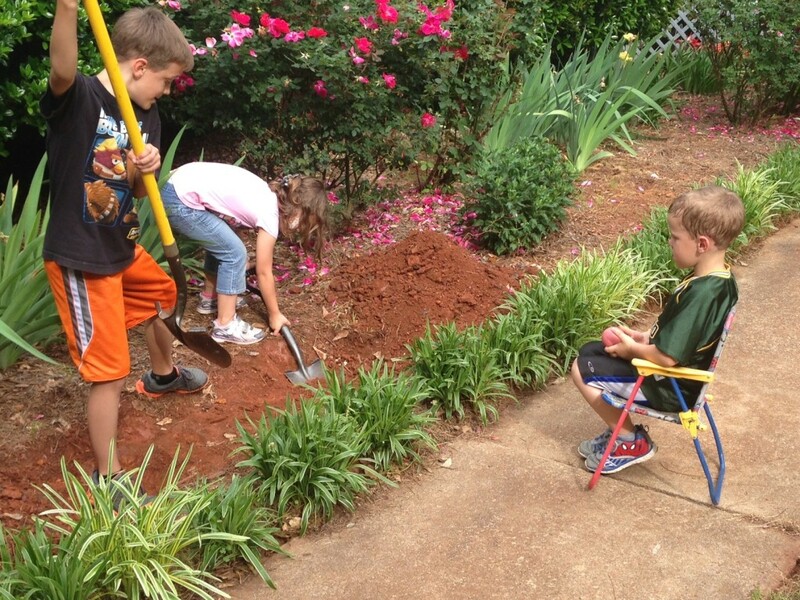 Tracie recently posted…Time is Running Out – Are Your Kids Prepared? Im actually considering doing the same with my 14 (almost 15) year old child. Yes i realize it’s late for this but i want her to start saving money to help finance her car and other things. Could you elaborate as to how much you pay your child and for what chorse? Also i have my own business and want her to work for me in effort to prepare her for the real world. Is this a bad idea? I don’t want to hijack the thread here, but I think when I post this comment, you’ll get a link to a blog post we wrote about this very topic. Basically, we pay our kids a large salary out of which they pay for their own clothing, shoes, school activities, school lunch, entertainment, charity, etc. In return, they are expected to work around the house. We don’t use checklists and we aren’t paying for chores in the way most people would think of paying for chores. We are not giving the kids the money as free money. Instead it is money we would have spent on them anyway (they decide how their activities money will be spent, we just decide how much they will receive each month). It’s important to note that we didn’t start out this way. We started having the kids take over one category at a time. Our kids were 7 & 8 years old at the time, so we started with school lunch. If they wanted to spend the money on lunch at school they could, but if they wanted to save it for something else, that was fine with us. I don’t know if I missed this or not, but do you only give the flat rate ($10 or $8, etc.) if they complete ALL the required chores? If they don’t complete the all, do they get a portion of the money or is it all or nothing? We have a chore sheet where they mark off when they have completed a chore and we pay them for what they complete. If they complete everything they get the max amount. If they miss a chore or two we don’t pay them for the chores they miss. They get money for the ones they complete. It’s not all or nothing. I knew some guys in the dorm who paid others to do their laundry because they didn’t know how…silly. I like the idea of some chores just being expected like making your bed and cleaning dishes after meals, and then other bigger chores like mowing the lawn being attached to dollar amounts that the kids can chose. It feels like a good balance so far. And I think it’s a good picture of reality in the workplace. We don’t get paid for every little extra we do at our job. Some things we do just because we work there. We don’t pay our kids for chores yet because they are so small. My 5-year-old does have to make her bed and straighten her stuffed animals each day or she can’t play after daycare! That’s good though you still have an incentive hanging out there for her to make her bed and straighten up the animals. Rewards come in all shapes and sizes. The amounts seem reasonable. That’s about what we do. Like you said, you can afford it in your budget and that’s what matters. As long as you can afford it, $1 per chore, for that age, is a good starting point. Your daughter’s chores are very similar to my daughter’s chores. lol Thanks for the post! Great info! Thanks for the feedback Kalen! Glad to know it doesn’t sound unreasonable. Sometimes when I’m paying $30+/wk. for chores it seems so. I feel the same way! I try to look at it like, the more I am dishing out, the more they are building a solid work ethic, but yeah, paying $30+ can seem like a bit much sometimes. Hey, your dryer looks like mine! LOL We used to do something similarly with our kids. Are they diligent about checking off their tasks? That’s something that we struggled with a bit. What got done and what didn’t. For the weekly chores, what if they’ve only done a portion of the items on the list? Do you prorate the payment? It happens. “Are they diligent about checking off their tasks?” I am reminding them, “Hey kids, have you done your chores?” We haven’t quite reached the stage yet where it’s done without suggestion. They do forget to check things off on occasion. Usually I don’t pay them for that even if I know they’ve done the work. I’m trying to teach being detailed and following through on the process. Up until now, I don’t think I’ve ever given allowance a thought.. but that’s because I don’t have kids (yet!) I think your system sounds great. I like that there are opportunities for them to make money if they feel like it or want it bad enough. “…opportunities for them to make money…” That’s giving them options. Sometimes they take it and other times they don’t. I think that’s a good primer on what it’s going to be like later on for them as an adult. That is a very smart system you have in place for kids and chores. It teaches them hard work and the value of a dollar at an early age. I like the fact how the cost of each chore varies based on its degree of difficulty. I’ll be honest, when I was a kid I was spoiled. My sister and I had it way too easy. I didn’t have an allowance and my parents bought me most things. I didn’t even do that many chores and my mom insisted on cooking the meals. I guess it didn’t really help that I didn’t have the desire (and still don’t today, but I cook now to save money). As I got older, in my teens I felt as if I needed more independence, so I made a point to apply to schools at least an hour drive away. I made my dad show me how to do the laundry before I went away and learned to do basic cooking when I was living off-campus. “…my parents bought me most things.” Of course, we are still purchasing most items for them. But I like having them responsible for some things. My daughter goes to Wednesday night church and they have an early session where they serve pizza. She’s using her own money for that each week. That’s one example of a nickle-and-dime expense that could get very frustrating for a parent to deal with every week. It’s her choice to go to that early session so she uses her money for it. “Vacuum mom and dad’s bedroom” nice 🙂 I don’t remember doing much more than setting the table and putting the dirty dishes in the dishwasher as a kid, but when money was involved I was always on board. My grandmother once offered to pay us per weed uprooted in her garden and made her calculation poorly so we worked and sweated all day and in the end she owed us more than a professional gardener haha. Looks like you have your price in check, and I am pretty impressed your 11yo can do his laundry! Love this, Brian. As you know, we do something similar with Lauren and Taylor. Like you, I don’t pay for the things that we consider to be regular responsibilities as members of our household. I post a job list and the girls can choose which tasks they want to complete. At this time, I don’t have weekly chores for them to do, it’s up to them to choose and complete the work. The amounts vary based on the difficulty of the task. It’s really been a great system and the girls have responded well to it. The girls were always pretty good about mindful of how they used their money, but now that they are earning money, they are even more careful, which makes me very happy to see! I like giving the kids some options for selecting which chore to do. Seems like that might break the monotony of doing the same chore over and over, week after week. We pay far below the going rate, but our kids are 2,4, and 6, so they are thrilled with any money. In fact, they would rather get 20 pennies than 2 dimes, even though they know it’s the same amount of money. I’m curious how the partnered chores go (cleaning up after the dog). Even though my kids are young, I can hear them bickering about who did more and who needs to do the rest (maybe they’ll grow out of it). We do have them each set up with a giving, saving and spending jars. I don’t do percentages for each, like putting 10% aside for giving. I think we might try to implement percentages later when they get older. Right now I split the money for the youngest two (who get $5/wk) out this way – $1 for giving, $2 for saving and $2 spending. The older two have a similar distribution with slightly more going into saving than spending each week. The cool thing is once they have $50 accumulated in their savings jar, we go deposit that in the bank. That’s always a fun trip for them. Wow! That is a lot of stuff for you guys to keep up with! How do you keep track of monitoring each chore completion for each child, including the bonus chores? We have a difficult time keeping track of just a few that my son has and I am always looking for a better system. I made a chart in Excel that has the chores listed for each child. There is a column for them to mark off when they complete the chore. Other than the ones I specified, they can choose any day of the week to complete a chore. When I see it’s marked off I check to make sure it was done. We pay them once a week based on that week’s work. Then they get a new chart for the next week. We try to spread chores out over the course of the week so they don’t have to do them all in one day. It does get hectic though some weeks when they forget or we are busy. Sometimes Saturday turns into a “do-all-your-chores” day.